The best way to honor those who have died in the belief that they were defending freedom is to work to end war. If ending war is Mankind’s greatest dream, why have we come so far from realizing it? I can remember thinking how cute I thought it was when young women competing for beauty prizes would say that there greatest wish was for world peace. It was so common that it was a cliché. I knew that for most, they were saying what people wanted to hear. Few would go on to work to make the thing they claimed to work for a reality. So it is with most of us. The greatest challenge to peace is the widespread belief in the self-fulfilling prophecy that it is not possible. If enough people rejected the belief that peace is impossible and worked for it, war would become unthinkable. If we want to assure that those who died for noble beliefs did not do so in vain, we must start by taking an honest and unflinching look at some of our beliefs and attitudes that are incompatible with being true Soldiers For Peace. It begins by making sure that we really believe that peace is possible. Otherwise, we are just going through the motions and cannot possibly see how it is possible. Paul Chappell has written stirringly in Will War Ever End? how most soldiers do not fight out of hatred of their enemies but from love of their families, nations, ideals and most of all, for the sake of those who face death fighting beside them. Those who are motivated by hatred are those who suffer most from the psychological wounds of war. It is unnatural to regard other human beings as nothing more than threats, deserving only of death. Only through careful indoctrination their commanders compel a human to kill another without hesitation. As Dr Ed Tick has written in War as a Soul Wound, it is the unconscious or conscious recognition after the heat of battle of the humanity of those they have killed that tortures their souls. Soldiers For Peace must learn from the insights that combat veterans learn at such cost. We must avoid the reflexive urge to regard those who actively promote war as our enemies, proper targets of our hate. The war to end war must be fought with love, not hate. From a place of peace within, not anger. In the end, our task is to bring about reconciliation between enemies. We must learn to see them not as “the other” but as brothers and sisters who have been led astray. It is up to us to bring them back into the fold, welcoming them as fellow member of our common human family. 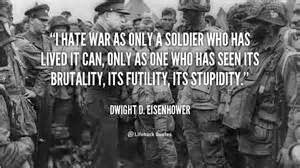 As a member of Veterans for Peace, I often encounter fellow veterans who think they are waging peace but who regularly succumb to the impulse to identify which side is responsible for any given conflict. They feel to recognize that it is our desire to establish blame that promotes the idea of “the other.” This is the root of the problem of our failure to teach our countrymen that it is our indoctrination to regard our fellow men and women as members of an alien tribe that allows us to accept the unacceptable reality of war. To combat this, we must train ourselves to forgive the aggressors even as we work to stop them. They are like our children. Our job is to provide boundaries and make sure that they do not hurt themselves or others in their ignorance, driven by base compulsions toward anger and aggression. If they must be punished, it must be done so that the lesson learned is that all humans are deserving of the same respect that we would expect from others, even if their actions anger us. Violence in any form is unacceptable, for unchecked it only leads to an endless cycle of hatred and violence. In my experience as a family therapist, I do not look for who is at fault in a family conflict. It is my job to study the family system to see how it promotes the conflict, then work with each member and the family as a whole to help each of them understand their role in the family drama that maintains an unhealthy pattern of interactions. I do not have to succeed with all of them. I merely have to reach one, motivate her to change her behavior. My job then is to help the family change the script so that harmony can be achieved and love becomes the driving force that guides their actions. On the scale of the human family, this is the only path to peace. We must learn to forgive our enemies before going into battle for their hearts and minds. A general, I believe it was Eisenhower, once said that he considered it a victory if he goes to bed with fewer enemies than he woke up with. He was not referring to how many enemies had been killed, but how many allies he had made. A general has to keep in mind that the ultimate objective is not to kill as many as possible but to achieve a just peace in the end. That minimizes casualties among both those in his charge and those they face on the battlefield. He knows that in the end, if peace is to last, our children must live with theirs. If our politicians shared this goal, they would never send our children to kill and die in war. Their objective is not peace through justice but to conquer and subjugate the enemies that they have created in the service of their Puppetmasters, the war profiteers who are ultimately responsible for creating our current global conflict. As citizens, it is the duty of each of us to let them know in no uncertain terms that they do not have permission to wage war in our names. To truly honor the victims of war on both sides, the soldiers and civilians, we must all become Soldiers For Peace. Occupy showed that the desire for real democracy runs deep in the US, uniting people across the political spectrum. From communists to libertarian conservatives, all who took part recognized that the US government is not one of, by and for the People. Occupy’s emphasis on the crimes of the banksters responsible for the economic crisis that sparked the protest brought attention to the fact that a tiny group of the economic elite control the fate of millions through their control over the US government. However, the failure to organize action around an agenda for change left some observers wondering whether We the People could effectively govern ourselves. For many, it merely highlighted what they see as the drawbacks to popular rule. When everyone is pursuing their own agenda, chaos seems to result. Ask a conservative about the state of democracy in America and you are likely to be reminded that the constitution established a republic, not a democracy. The importance that many people attach to this distinction may seem puzzling at first. After all, Americans are taught that another name for their form of government is “democratic republic.” Most of us fail to realize that democracy and republicanism are distinctly different things. However you want to dress it up, a republic is not a democracy. Democratic republicanism is a contradiction in terms. Having the right to vote for representatives who may or may not represent your interests is not the same as being part of the decision-making process of government. The irony is that somehow, those who are most aware of the difference seem most uncomfortable with democracy. Many libertarians I have met define democracy as “mob rule,” where a tyrannical majority can and will demand that the state take care of them, regardless of their willingness to work. This is a variation on the fear of some of America’s founders that the majority would always trample on the rights of minorities, especially the right to amass wealth. It is unsurprising that the prospect of democracy would frighten those who identify wealth with virtue. Since the liberty to enrich oneself without government interference such as regulations on corporations has become synonymous with “liberty,” democracy is paradoxically regarded as a threat to freedom. Those who believe that most people are lazy and willing to live off the fruits of their labor if they can seem to prefer to place their trust in the hands of people of wealth, which they associate with hard work. They see themselves as virtuous for supporting the slashing of the social safety net because they believe that forcing the unemployed to work at whatever menial labor they may be lucky enough to find.saves them from a life of sinful sloth and indulgence. However, failing to take social responsibility for ensuring the ability of people to succeed in America’s economic system leads to the very scourge they seek to eliminate. As more people fail to find work at a living wage, the middle class collapses and the economy worsens. This has led to increasing reliance of individuals on government that so troubles them. Instead of focusing on the root causes of the collapse of America's middle class, those who fear big government more than those who control it accuse those concerned about economic inequality of waging class warfare. Not only are they blind to the fact that the economic elite have made war on the rest of us, but they identify with the aggressor. If we are ever going to realize democracy in the US or the world, we have to make such people understand that they are part of the 99%. Regardless of any ideological differences betweeen us, we can agree that the government is being administered by politicians who are thoroughly corrupted by special interest money. We must unite to demand an end to the corruption, or our differences will mean nothing because politicians will use our division to advance the interests of their patrons over those of We the People. For the first time since the ancient Greeks, America’s founders faced the issue of whether a People could rule itself. The debate focused around the question of whether Americans were good enough to consider the best interests of all when making decisions for the nation. On one side were those who believed in the essential goodness of men. Statesmen like Jefferson argued that an enlightened and educated society could rule itself justly, with due respect for individual rights. Others like John Adams were raised to believe in the religious doctrine that men were inherently evil. Such men cowered at the prospect of allowing average men to participate in the decisions that affected their ability to profit from the riches that America offered at that time. In the end, those who had economic power in the colonies made the decision for all Americans of that time and ever since. They chose to elevate property rights above the well-being of average citizens, especially the disenfranchised who were treated as chattel in fact, if not law. It is obvious that the rich have no inherent right to rule, but that is the inevitable consequence of republican government. Instead of government of, by and for the People, Americans are living in an oligarchy. The idea that there is a natural aristocracy based on merit has been perverted. Raised to believe that the American form of self-government eliminated the hereditary class system of England, it has arisen in the New World. The progress made toward democracy in the course of American history has been largely forgotten. The willingness of modern Americans to submit to the rule of corporations and the wealthy has allowed them to seize power in Congress and the White House. Thus, those who believe that men are inherently evil have turned over the power of government to crass politicians who have shown that their primary purpose in life is to promote the interest of the ruling class. One wonders how they can imagine that this is better than democracy, where all stakeholders are represented. The belief that we are not good enough to rule ourselves is not confined to conservatives. Liberals, seeing that most of those in power are self-serving, largely accept the belief that this is inevitable. The belief that “all politicians are corrupt” is perhaps as widespread among liberals as conservatives. This has led to a mass exodus from the political process, leaving those who seek power for its own sake more firmly entrenched than ever. This political class is convinced that it alone possesses the collective wisdom to rule over the rest of us. In fact, its members are devoid of the vision that would save us from the consequences of their greed and short-sightedness. As members of the economic elite, they are blind to the ways in which their efforts to mold the world in their image is leading to the demise of freedom. They cannot see any way forward that does not serve to perpetuate their privileges. In accepting the Randian view of the universe, they have become prisoners of the dystopian reality they have created. The only way to save ourselves from being led to self-destruction by blind leaders is to create real democracy in the US and the world. 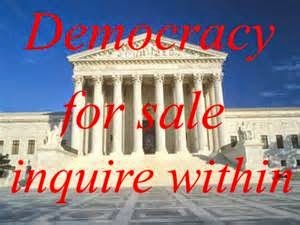 It starts with electing members of Congress who will support a constitutional amendment declaring that money used to influence political campaigns is not speech and that corporations do not have constitutional rights. Americans must learn to see beyond the artificial right-left divide and work together in this common cause. It is up to them to ensure that the hope of government of, by and for the People does not perish from the Earth. Only together can they make that dream real. It starts by recognizing that democracy is the only way by which to avoid plutocracy.